It’s a great problem to have when your garden is producing so much zucchini and squash that you have trouble using it all before it goes bad. It’s late July and I totally have that problem. This is why I decided to put together these 7 healthy zucchini recipes. Zucchini diverse in that you can cook it in so many ways. The first recipe, Zucchini fritters, is Bill Bradley’s go-to recipe for an amazing appetizer. Koula Barydakis makes this in her cooking class in Crete, and we make it all the time here in America too. 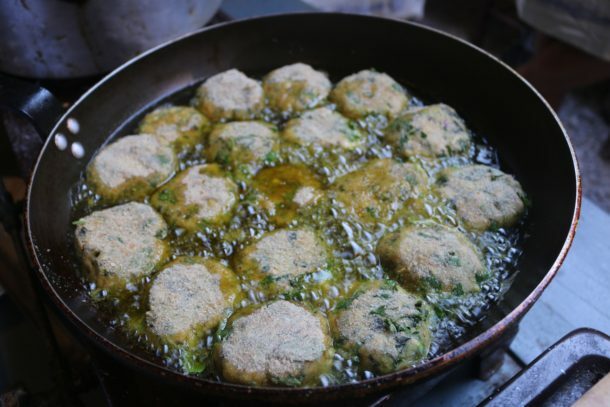 Frying the fritters in extra virgin olive oil from Crete makes them insanely delicious. Next is a beautiful rustic omelet recipe also from the island of Crete. When I lived in Crete I made a version of this every week because my aunt and uncle always had fresh zucchini, tomatoes, onions, eggs, and herbs on hand. It’s one of my favorite Mediterranean diet breakfast recipes. Our friend Craig Fear, a Nutritional Therapy Practitioner and Cookbook Author, was cool enough to share his new zucchini soup recipe with us on a whim. He just published this recipe to his blog, Fearlesseating.net, and just in time for the abundance of zucchini. If you love basil and lemon, definitely give Craig’s zucchini basil soup with lemon recipe a try. Next, we were lucky enough for award-winning cookbook author Aglaia Kremezi to share her crustless zucchini pie recipe with us. 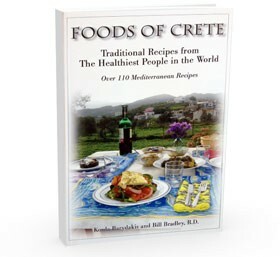 She teaches cooking classes in Greece and is an important figure in the Mediterranean diet. The next recipe is from another renowned cookbook author, Nancy Harmon Jenkins. She wrote “The Mediterranean Diet Cookbook” in 1993 and is an expert on the Mediterranean diet. Her gratin of tomatoes and zucchini recipe has been one of the most popular recipes on Mediterranean Living for years. Next is my zucchini fries recipe with tzatziki. These are also fried in extra virgin olive oil and have a panko breadcrumb mixture loaded with Mediterranean herbs. The cool refreshing tzatziki is the perfect dip for these fries. Lastly, check out a video from Bill Bradley R.D. on how to make a simple and healthy zucchini recipe, Zucchini and Summer Squash with Roasted Almonds. I hope you enjoy the healthy zucchini recipes and video and are ready to use up all that zucchini! This is it. 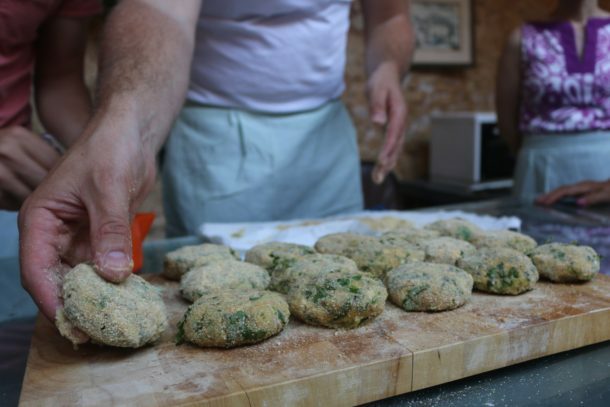 My all-time favorite recipe from Crete, maybe from the whole Mediterranean Diet: Zucchini Fritters by Koula Barydakis. How can one go wrong? Zucchini, onions, fresh mint, fresh parsley, two cheeses (feta and cheddar), bread crumbs, and eggs made into delectable morsels and then fried in extra virgin olive oil. These are great for any meal, eaten with eggs for a true Mediterranean Diet breakfast or with a Greek salad at lunch or dinner. Hell, I made them for our wedding! I usually will double the batch, fry them all and then freeze leftovers in ziploc bags, about 6 per bag. They defrost quickly and are great for when you don’t know what to make for dinner or just need a speedy snack. Sometimes, I serve them with Tzatziki on top or just plain Greek yogurt. They are a complete meal in themselves (healthy fat, protein, carbs and healing herbs). They are always the most popular hors d’oeuvre at any party and you will make friends if you bring them. Traditional Cretan Zucchini and Onion omelet is a great fit for breakfast, lunch or dinner. This Mediterranean Diet breakfast recipe is very simple to prepare and presents beautifully at your table. It is both delicious and nutritious. We especially recommend pulling out this recipe when your garden is overflowing with zucchini! Zucchini and Onion Omelets pair well with flavored Greek Yogurt. Add cumin, fresh garlic and salt to the yogurt and place a dollop on your omelet servings. For breakfast, we love this dish with sourdough toast. Serve for dinner with sliced and salted tomatoes or Mediterranean Living’s Greek Salad. One of our favorite healthy zucchini recipes for breakfast. Our friend Craig Fear, a Nutritional Therapy Practitioner and Cookbook Author, was cool enough to share this zucchini soup recipe with us on a whim. He just published this recipe to his blog, Fearlesseating.net, and in perfect time for the abundance of zucchini. Today we have a special treat for you. We welcome Aglaia Kremezi, award-winning cookbook author and educator on Mediterranean diet and cuisine. Aglaia teaches cooking classes in Kea, Greece. Here she shares her recipe for Crustless Zucchini Pie from her book “Mediterranean Vegetarian Feasts.” This delicious recipe is here just in time for zucchini season! When I think of zucchini fries, I imagine myself in Greece during the summer, sitting at a table filled with fresh seafood, greek salad, bread, and plenty of wine. I imagine dipping them in tzatziki to cool them down and watching as the plate of fresh zucchini fries disappears in front of me while all the hands reach in and take them before they’re all gone. I love zucchini fries because they’re crispy on the outside, and soft on the inside. I dip these in refreshing tzatziki sauce for some coolness that compliments the fried flavor perfectly. I decided to use panko breadcrumbs because they get extra crispy. I put a lot of dried herbs into the panko breadcrumbs to give them more Mediterranean flavor. I use mint and oregano in the breadcrumbs and dill in the tzatziki so you get a nice combination of herbs. I am excited to try these recipes since Zucchini is on sale everywhere. It’s nice to find new uses for the stuff! Thanks for commenting. Let us know what you think about the recipes that you try!